NCCER – The leader in construction training,education, workforce development and accreditation. When you think about a career that involves math, most of us tend to think of an engineering field. We never think to equate mathematics to a possible career in the construction industry. As a mathematics teacher, I would stay up many nights thinking how I can make the abstract concepts presented in my class come to life for my students. It wasn’t until this summer; while completing an externship with R.W. Allen Construction did I discover the ultimate math playground. 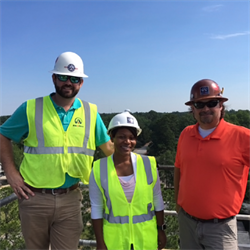 I had the opportunity to visit job sites and listen to the construction site superintendents and projects managers on site discussing MATH. I could not believe what I was hearing. You mean to tell me that if you like math and enjoy communicating with others you could possibly have a career in the construction industry? I started to think back to my first years teaching and how valuable my externship experience would have been during that time. As I walked and listened to various conversations, I saw and heard the principles of geometry and trigonometry brought to life. I used to teach the Pythagorean Theorem to students and could never answer the question, “When would we ever use this?” I never knew the answer to this question was hiding on many construction sites. Construction workers may have to know the length of a triangle’s hypotenuse in some cases where measuring maybe difficult. This calculation would need to be done “on the fly” without paper and pencil. To better explain the need and application of math theory and calculations, exposure to the various math-based careers in HUGE. Our students need to be exposed to the many career opportunities available within the construction industry. I never would have thought as a female I would consider a career in construction. It wasn’t until my summer externship I was able to see myself doing something that I’ve always been so passionate about suddenly present itself on a construction site. We have to refocus our attention and think about ways we can get students to see how math can be used as a tool for a potential career within the construction industry. It is time for the hidden math playground that lies within the construction industry to be uncovered. It is time for our school counselors, educators, and community partners realize the many benefits the construction industry provides to the future workforce. It is time many adults and children change their thoughts and perceptions about the construction industry. It is time we help our current students aspire to be technically trained through mathematics and construction skills and accept all careers as valuable skill set. It is time we uncover the hidden math playground that lies within the construction industry.